Last week Savannah Robinson our Communications and Community Engagement Coordinator, via our video conferencing centre, engaged with students from across New South Wales, giving them tips on how to effectively communicate a project they are working on called: Sustainability in Transport. The students are faced with the challenge to create and communicate an artefact linked to sustainability in transport. Some early ideas involve solar powered cars, a wind generated car, sustainable livestock transport and a ferry on wheels. The most recent video conference session included six NSW schools to assist them in preparing to communicate their project to their peers, local media and the general public. Their creative works will be on display to thousands of other students and teachers at the Youth Eco Summit at Sydney Olympic Park, 23–24 October. This video conference session was just one in a 3-month series featuring professionals from across different fields to support the student’s learning as part of the new curriculum based program on Sustainability in Transport, “driven” by NRMA Motoring & Services, Fizzics Education and Sydney Olympic Park Authority. 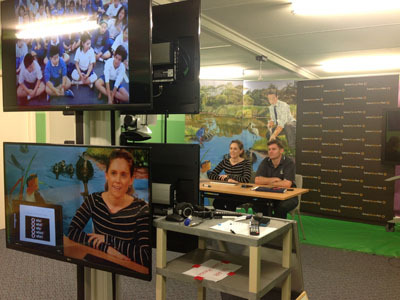 The majority of schools in NSW now have the technology to “dial” into a video conference session from their classroom or library and interact with other schools and presenters based at Sydney Olympic Park. Our video conferencing centre allows us to connect directly with one of these schools or have a conversation with many schools all at the same time. Loosely called ‘virtual excursions’, these live, highly interactive and educational video connections are fast becoming a daily activity, providing unique learning opportunities and direct access to the Park for students no matter where they live.